Grab your thick-rimmed glasses. It’s about to get hipster up in here. A simple Green Smoothie. There are nearly thousands of these things floating around on the internet. But I’m here to tell you why mine is the best. Thoroughly balanced for flavor and nutrient retention. Velvety smooth and utterly thick. Full of hipster-approved ingredients. Let’s get blending. A frozen banana is the star student in this delectable concoction. Without it, we wouldn’t have a creamy, dreamy breakfast smoothie to guzzle. The texture that banana gives smoothies resembles that of a thick milkshake (I was always a thick milkshake kind of gal – how about you?). Bananas also give us some cardiovascular and digestive boosts. They’re also the sole sweetener in this smoothie! 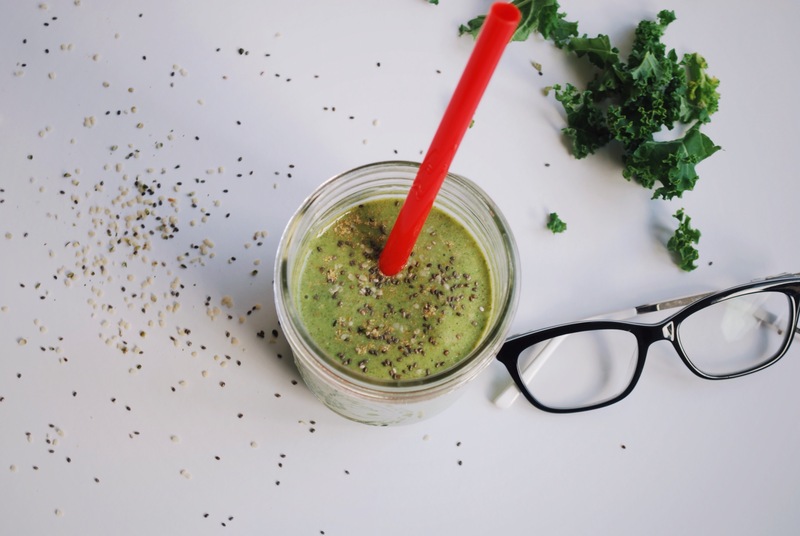 The green color of this smoothie is directly linked to beautiful kale. It’s not a surprise that I love kale and all of it’s vitamin A and K and iron fighting power! To be completely honest, this was the first time I ever put kale in a smoothie, as I always turned to it’s more mild cousin, spinach. I was always nervous about the taste that kale would impart on my liquid breakfast. I am now a believer in kale’s ability to give me the nourishing benefits without leaving behind it’s earthy, peppery flavor. I love chia seeds. I love hemp seeds. I love flax seeds. That’s why we’re using all three today! The seeds give us some protein and healthy-fat lasting power. I don’t know about you, but when I eat a breakfast that’s just full of carbs (ie. fruits, vegetables), I’m hungry about 10 minutes later. These miracle seeds will help subside you until your next snack and/or meal. I’m a spice lover and an even bigger cinnamon lover. I like to throw some cinnamon in all of my smoothies for a couple of reasons. First, the taste. I adore cinnamon’s bite and warmth. Adding it to a cold smoothie is the perfect addition for a little sweet heat. Second, the health benefits. Some studies show that cinnamon lowers blood sugar! Cinnamon for the win-amon. Last, almond milk. I chose unsweetened almond milk because I’m pretty addicted to the taste and texture. It’s creamy, nutty, and vanilla-y – exactly what I’m looking for in a smoothie base. 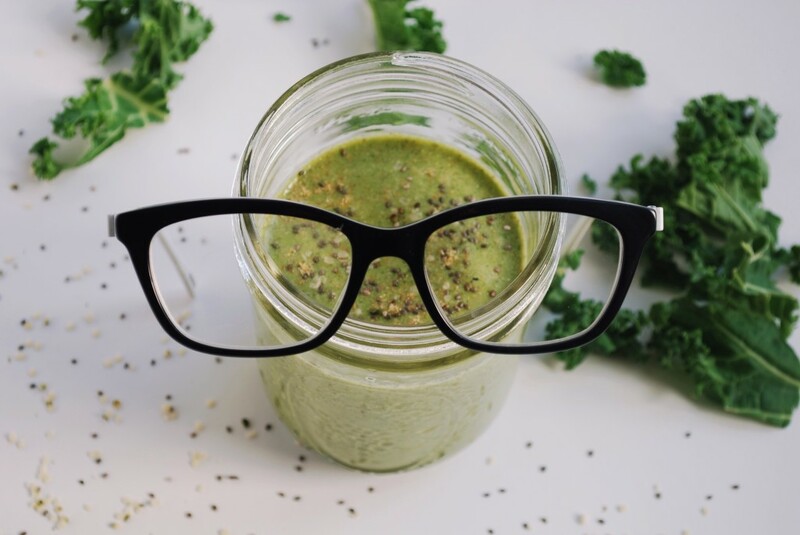 You could totally go all-hipster and make this smoothie with hemp milk! Actually, you should definitely do that. I’ll wait here while you run to the store. 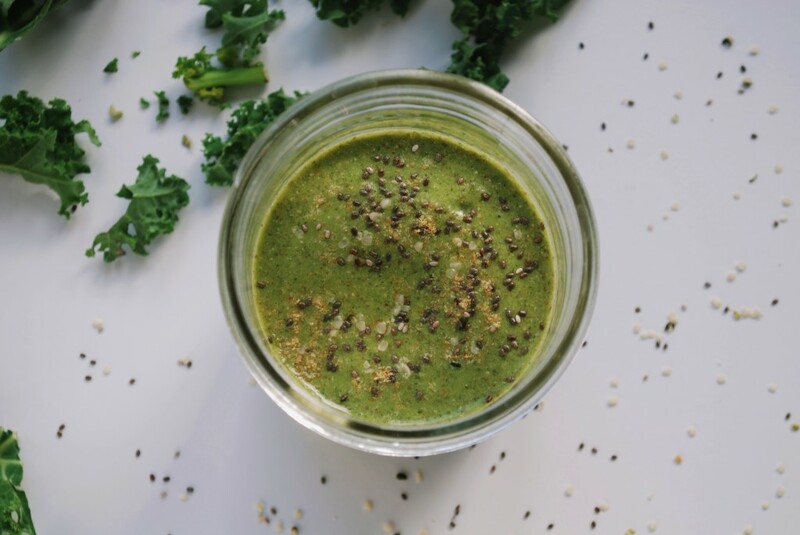 Although smoothies are typical of breakfast, I’m partial to drinking this smoothie as a snack or as an addition to a small bowl of oatmeal for a more complete meal. Or feel free to add some nut butters if you’re wanting some extra creaminess and healthy fat power. So go grab your vintage clothing, grow out your bushy beard, brush off your sense of irony, and marvel in you wonderfully-hipster healthy creation. Break out that sense of irony; this vegan and gluten free Hipster Smoothie is full of the healthiest hipster ingredients and 10g of protein for a nutritious morning meal! Place all ingredients (except ice) in a high-powered blender in the order shown and blend until smooth. Add ice for a thicker texture. Pour into mason jar (not optional) and drink while your cold-brew coffee is brewing. Alexa! Girlfriend, you need to write a book! Making me laugh over the write up of a smoothie is hard to pull off, but you did it :) Good stuff, and the smoothie sounds yummy too. Love your blog! You are so sweet, Julie! This comment made my day.